Filipinos aren’t “Juan Tamad” after all! Many years back, Filipinos were “fed” with what I would call as “disheartening” personality and character description begotten by our “conquerors” which was in reality a sort of a “reverse psychology” tactic to stop any form of rebellion. The disparage though did not stop our national hero, Jose Rizal, and others Andres Bonifacio, Manuel Luna, Emilio Aguinaldo and a lot more during the Spanish regime, and those during the American conquest like Manuel L. Quezon Sergio Osmeña, José P. Romulo, et al, to voice out their views against our “masters”. During the period of conquest, Filipinos were treated as “third class” citizens by the Americans, and our Spanish “conquistadores” described us as “indios” and “insolentes”. To complete the “character assasination”, the Americans had song lyrics changed to English that depicted the hard labors Filipinos are faced with. One of which was “planting rice is never fun….”. A song to discourage Filipinos to till rice fields and shift into industry, although the Philippines was already then a purely agricultural country. Our national anthem was also translated to have an English version that was sang in the 50’s. But the two “conquistadores” have inculcated in the minds of the Filipinos with something I would say the most demeaning personality characterization – Juan Tamad. Of course we know very well what “tamad” means – lazy, and for all we know, as years pass, we have proven that we are not really that “lazy”, as they thought we were. The legend of Juan Tamad has even taken a part in the study programs in our schools. We learned a lot of stories about Juan Tamad at young age. We are now conscious of the fact that we “were intentionally poisoned” to believe that Filipinos are “lazy”. It’s turning out now that we aren’t lazy after all! So, who among our conquerors really propagated that Filipinos are “lazy? For ease of recollection, let us relive the legend of Juan Tamad. 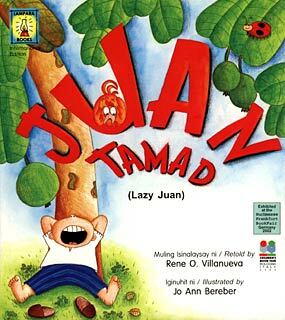 Juan Tamad (Lazy John) is a famous character in the Philippines who was noted for extreme laziness. Portrayed as a child in many stories, Juan was not only described as “lazy” but at the same time “stupid”. In one of the stories told about Juan Tamad, he came upon a guava tree bearing large ripe fruit. 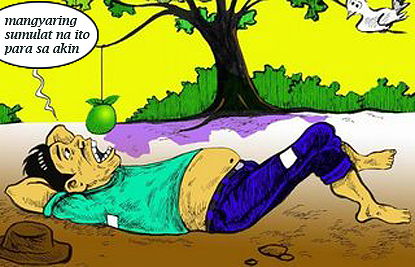 Juan, being too lazy to move to climb the tree, stayed laying down under the guava tree and let nature’s gravity drop the fruit for him to eat. He remained there waiting for the guava fruit to fall into his wide gaping mouth, which of course never happened because Juan Tamad was “beaten to the fruit by a bird”. That showed how lazy and stupid Juan Tamad could be. There were lots of stories about Juan Tamad. Famous ones were entitled “Juan Tamad and the flea-killer”, “Juan Tamad courts Maria masipag”, Juan Tamad takes a bride”, etc. But in all of these stories Juan Tamad remained as “lazy” and as “stupid” as he had always been portrayed. Filipinos were personified as all like being Juan Tamad. Which was or is definitely UNTRUE! He noticed a nearly ripe guava fruit hanging from a branch. “But my arm feels tired,” said Juan. Waited for his favorite fruit. Until the guava became fully ripe. The guava was already full of holes. Friends, the legend of Juan Tamad should be left as such, a legend. We’ve learned a lot from it, and perhaps it also served as tool that changed the Filipinos to be what they are right now, who for all intents and purposes, were/are never “lazy” or “stupid”…. although a few may still be. I am not here to judge anyone, I only adhere to the saying “in every forest there is a snake”…if this saying has a relation at all to the story. Have a wonderful day ahead…..Eric. NOTE: We have posted a new entry PHILS NOW VIDEOS. Watch the recent developments in Metro Manila..
New entry has been posted in Madrid job offers. Please view announcement for anyone you know who is looking for a job. PLEASE SEE THE NEW PAGE “QUIZ TO MADRID“…AND TAKE PART AND HAVE A CHANCE TO TRAVEL TO MADRID!! Next Post QUIZ TO MADRID BEGINS!! Some Filipinos still fit in the “Juan Tamad” description. When will they change??? True. Realization come when it’s already too late. It’s only when those “some” realize that matters are not really, really going good that they start “lifting a finger”. Thanks for your comment as always.